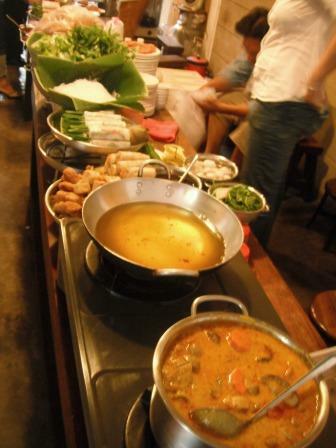 Our first meal in Saigon was a sensation. We went to nha hang ngan, a very large busy restaurant a short walk from the May Hotel. We had green papaya salad with shrimp and pork (Goi Du Du Tai Heo) which was crisp and fresh with a sweet sour sauce, and Vietnanmese Rice Pancakes stuffed with vegetables and seafood. (Banh Xeo) washed down with Saigon Beer for some and watermelon juice for others. You walk past the kitchen as you enter the restaurant and all the produce is laid out. You can see exactly what you are getting, and how it is cooked.